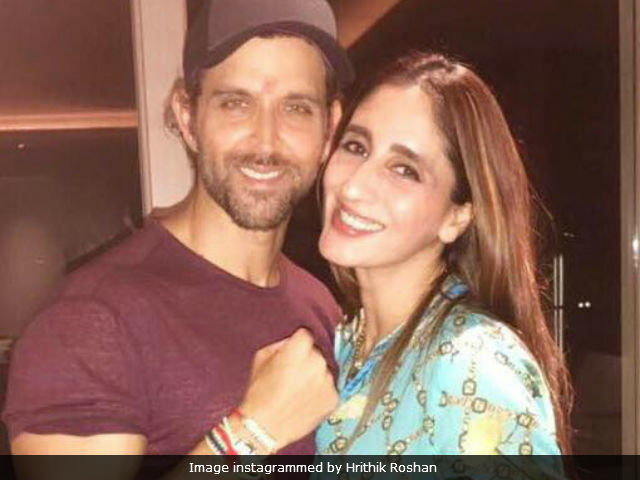 Farah said she admires Hrithik for his "constant support and love"
We spotted a special moment in the collage that actor Hrithik Roshan posted of his Raksha Bandhan - apart from his sister Sunaina and cousin Pashmina (daughter of Hrithik's uncle Rajesh Roshan), jewellery designer Farah Khan Ali also tied Hrithik a rakhi. Farah is the sister of Hrithik's ex-wife Sussanne Khan and she wrote on Instagram that she admires Hrithik for his "constant support and love." Hrithik's message to his sisters was also very sweet. "To my dear sisters, a brother's solemn promise to always be there for you even when you don't miss us," the 43-year-old actor wrote. Hrithik and Sunaina Roshan are the son and daughter of actor-filmmaker Rakesh Roshan. Sunaina, who is married to businessman Mohan Nagar, has co-produced some of the Roshans' films, such as Kites. Pashmina's father Rajesh Roshan is a music director. Sussanne and Farah Khan are the daughters of actor Sanjay Khan. Sussanne and Hrithik have two young sons and they are often spotted at events or on holiday together. Hrithik Roshan was last seen in Sanjay Gupta's Kaabil, co-starring Yami Gautam. He will next feature in Vikas Bahl's biographical movie based on mathematician Anand Kumar's life. Hrithik is also supposedly prepping for Krrish 4, to be made by father Rakesh Roshan.